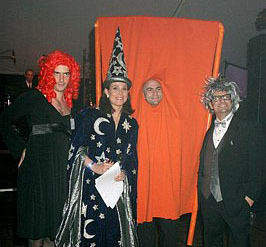 Every year the Central Park Conservancy holds and annual Halloween Ball to benefit the park. I think plates run in the $1,000-$3,000 price range. Because Bloomberg LP is a corporate sponsor of the event, a handful of employees are invited to attend each year. The guest list is first come first served. Fortunately, the invite was over email, so Kennyb and Ben were obviously the first to respond! A friend of ours, Mike Schiraldi, also responded and scored a spot at the Bloomberg table. The affair was billed as "Black Tie with Costumes Encouraged." There were going to be costume contests for Best Male, Best Female, Best Couple, and Best Group. We decided immediately that the three of us were going to win Best Group. As with all good costumes, we needed something very topical and we needed something appropriate for our target audience. Additionally, Mike had recently acquired a tux, so we wanted to try and incorporate that into our costume somehow. 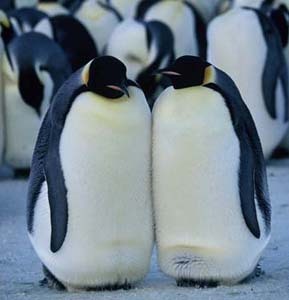 Our first idea was to dress as the characters from the March of the Penguins movie. While both topical and could easily incorporate tuxedos, we decided that wasn't Best Group material. Plus Kennyb kept messing up the egg passing dance. We also debated dressing as Bird Flu, but couldn't figure out how quite how to build it. 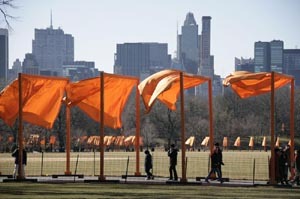 We needed something very New York, and something that the attendees of a Central Park Conservancy Benefit would appreciate. 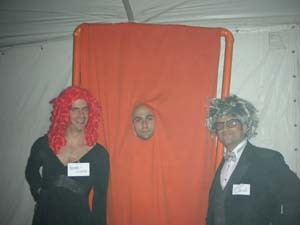 In the end, Arin came up with the brilliant idea of dressing as Christo, Jeanne-Claude, and the Gates. 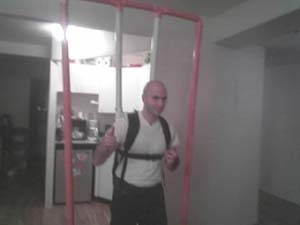 As with any great costume, the first stop was Home Depot to buy 30 feet of PVC piping. While we were walking around the store, I was reminded of a great quote by Rob Cockerham: "I was at Home Depot that morning, buying some paint and lumber for another project, keeping my eyes open for people buying funny materials for their costumes. It took me a minute to realize: Normal people don't buy stuff for their costume at Home Depot." Kennyb and Mike simultaniously called dibs on not being the chick, so Ben got stuck with that role. Mike was excited about his tux, so he get to dress as Christo. Ben agreed to buy a fancy party dress and go as Jeanne-Claude. We sketched out the design which was going to involve building a supporting frame inside a backpack with the Gate mounted on top. When deciding how big to make the Gate, we decided to think back on some of the important lessons that Kennyb has taught us over the years: "quantity is funny" and "go big or go home". (Note that he has also taught us that watching midgets on an 8 foot screen creates quite a bit of cognitive dissonance, but that's a lesson for another day). We cut out a face hole for Kennyb and viola! The trio looked great! We geared up after work and walked over to Central Park for the party. When we entered, the first thing someone asked us was "Are you with so and so? You know, the other gate costume?" We were crushed. Someone else had a Gates costume? 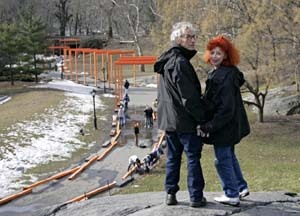 It turned out there were 2 other couples dressed in Gates costumes. Although theirs were both modestly sides chest plates. They paled in comparison to our 8 foot x 4 foot creation! 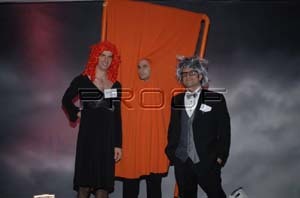 We entered the ball, which had about almost 500 attendees. It was extremely crowded and almost everyone was in costume. Due to Kennyb's limited mobility, we mostly stood in the corner while waitstaff brought us drinks and little stuffed mushroom caps. Here is a great picture of us against a professional backdrop. We stole it from some dude's site, which is why it says "PROOF" across the front. Sorry dude. After a few minutes and about 100 different people taking our picture and offering tons of compliments, we were approached by Sigourney Weaver. She was one of the judges for the evening, and was very impressed by our costume. She was dressed in a which outfit, but said that she wasn't from Harry Potter. We chatted for a while, and got her to take our picture. A couple minutes later Alec Baldwin came up to us to compliment our costumes and we got him to take a picture as well. We had fantastic dinner, and afterwards entered the costume contest. There was a panel of about 5 or 6 judges, and we WON!! Huge!! 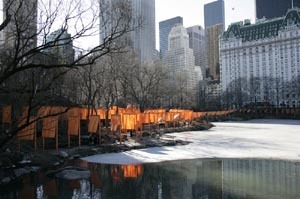 The prize was a half-day for each of us at the Mandarin Oriental Spa, a $500 value. Huge indeed! More pictures of the event are available a the New York Social Diary. We're near the bottom. 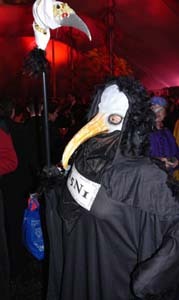 Oh, and someone managed to dress up in a fantastic Bird Flu costume!